A few weeks ago, the staff at Caleb Funatia (Foundation) were overwhelmed and very happy to receive a truck full of goods. The container that was arranged by “His Church” consisted of food, diapers, shampoo and a few tools. His Church has partnerships with supermarkets and other organisations and they make arrangements for goods to be provided and distributed to organisations making a difference. Luckily for us, this month the lucky recipient was the Caleb Funatia and Proton. 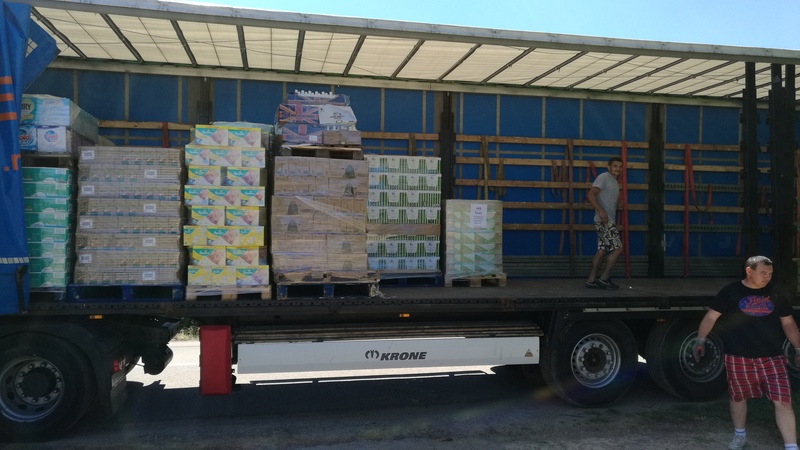 We needed to make arrangements for transportation costs and requisite administrative / customs costs as the goods were transported from the UK to Romania. The Caleb Funatia and the Proton Foundation have split that costs, and the goods will be going to the various projects that we partner with Caleb Funatia in Lazareni and Poiana to achieve. Most of the goods will be distributed to the gyspy community in Lazareni. The food items will be used in the Kindergarten and AfterSchool projects. Some sweets will be used as incentives in most programs. We then have a lot of diapers and sanitary products for the Diaper a Day and Dignity Project. Some of the canned food will be used for meals our church, New Life Center provides every Saturday for 80 homeless. The tools and other DIY items will be used by our men in the apprenticeship program. We are excited to see how these goods will help the people of Lazareni. Our gratitude and thanks to His Church for their investment in the Lazareni community.